As the moon turns full today in Aquarius things may go a little out of whack. Aquarians are known for their eccentric thinking so just bear with this energy for a while and take note of anything that is happening around you that you may think of as unusual, out of the ordinary or not normal for you. The Moon card can cause confusion alongside perhaps not being sure of where you are going. 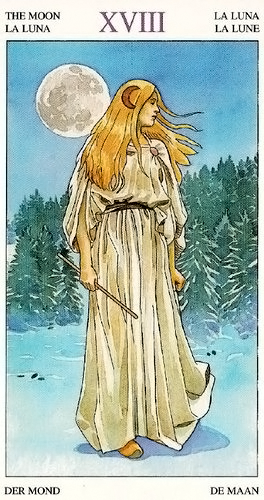 The image on this version shows a woman who is perhaps not dressed for the cold weather and yet there she stands looking around to see where she needs to go to next. Do not be deceived by her fragile appearance for the imagery also suggests that she is very good at manifesting her dreams and desires. The “wand” she holds in her right hand is not being used at the moment but she has the choice as to whether she wishes to draw upon what is around her and bring together more cohesion in an attempt to gain what she wants. Be on the lookout today for things which may at first not be what they seem. The moon can cloud your better judgement and this is particularly so when it is full. If you have any major decisions to make just now then perhaps it is best if you were to put them off for a few days and wait for the energies to die down so you can see more clearly what your next step should be. There are no footprints in the snow for a reason… it is because you are not sure of where you are going or how you got to where you are now. Best take this day off and enjoy any eccentricities the Aquarian full moon blesses you with. The card used for today’s tarotscope — The Moon — is card is part of the Sorcerers Tarot by Antonella Castelli, who also designed the Tarot Art Nouveau and the Astrological Oracle cards. This is a Lo Scarabeo deck, published by Llewellyn.